Is that a chapter of Ray Donovan's life closed? On Ray Donovan Season 3 Episode 8, it appears as if we have closure, or as close as we might ever get to closure, on the priest abuse and subsequent murder that has haunted the Donovan family. While it will never go away, Ray appears to have a chance to change how he looks back at what has happened in his past. While I was skeptical of Father Romero's motivations and the rather irritated way he took to dealing with Ray on Ray Donovan Season 3 Episode 7, after some reading, paired with the events of "Tulip," I think he's on the up and up. Before we chat about Ray and closing the book on the priest story, let's talk about the Finney family and Bridget. Things aren't shaking out so well where they're concerned. Poor Varick was rather blindsided on all fronts, wasn't he? Not only did the divorce take him by surprise, but being shown the door by Finney didn't sit well at all. Considering he had been Finney's lover, employee and son-in-law, you'd think he would have known the man well enough not to push his buttons to the extreme. Wrong! Finney didn't like being he was told he was a gay man any more than Varick enjoyed the events of his particular day, and altogether it meant disaster. I've always imagined having a Finney moment of blind anger overtaking me just as I've imagined being on the receiving end of said blind anger, as was Varick. Varick's reaction after being struck gave me chills. That realization of what's been done to you is shocking (although I've never been killed, obviously, I have been utterly shocked as the victim of a crime) and the whole scenario is nightmarish from all sides. As horrible as it was, it ultimately brought Ray and Avi back together and ensured the NFL deal has a chance to move to the next level. I get Avi wanting to talk to someone about killing Kate, but I just don't think it's appropriate that the person he shares his experience with be Ray. He says Ray is the only person it can be, but how about Lena? Hearing Ray say he would have rather gone to prison than have Kate killed may not have been true, but it held some weight nonetheless. While Ray's running around securing his deal and getting Finney out of a bind, Abby was trying to get Terry to reconsider his decision to move in with them while Bridget decided to visit Mr. Donellen at home despite his warning that he knew their contact outside of school was inappropriate. Mr. Donellen has a medication problem. He's not only severely depressed after the loss of his wife, but he appears to be addicted to vicodin and other drugs; perhaps even allergic in some way. Something is very wrong with Mr. Donellen and his medication. There is also something very wrong with Bridget. This isn't just a story about a young girl with a crush on a school teacher, but one of a severely depressed young woman who is going down a very dark path. Considering what Ray has seen in his line of work, I'm highly disappointed he didn't demand she be taken to counseling after what she witnessed in the backseat of that car. Bridget is spiraling out of control. She's not only getting failing grades in a new school, but she is now taking advantage of an adult she knows very well has addiction problems. Bridget is not a stupid girl. If Mr. Donellen wasn't passed out on his couch, I wouldn't put any of the blame on her, but he keeps saying no, and even after she sees evidence what he tells her is true, she continues forward. Ray needs to tend to his own house and remember he has a family who needs him. Can he do that now that the Romero situation is handled? What Father Romero told Ray about excommunication is true. Being excommunicated means you cannot take communion. He is still a Catholic who can attend mass, but is deprived of all other sacraments until he has received penance for his sin. Can a priest excommunicate someone like that? It's unusual, but apparently can be done. People are also excommunicated automatically for certain sins. Father Romero told Ray he has suffered enough, and I think he meant it. What he did previously was in the heat of the moment. Perhaps he was frustrated that Ray came so close, sitting in the confessional (yes, he could have confessed anywhere, but it's TV) and ran. Aggravation led to screaming like a bit of a loony toon. Ray has had troubles with the Church in general. He doesn't think much of the sacrament of marriage, and definitely has his issues with the Commandments. Being excommunicated, if he really took the time to examine what he feels about his life and his faith, could be good for him. But until the run of Ray Donovan is over, I don't see that happening on a deep level. It's a journey Ray is not yet ready to take and not one I'm sure we're ready for him to take, either. He has to reconnect with his wife. He has to recommit to being a good father. He has to come to terms with his own father. Many things have to fall into place before he's ready to accept his place in the Church again, if he would even want it. There's little doubt, however, that Liev Schrieber could take the conflicted and tortured soul that is Ray Donovan and convincingly put a solid foundation beneath him when the time is right. The cuts to Ray digging the the grave were significant on many levels. He might have been digging it to cover Finney's track's, but Ray was also going through the motions of burying his past. I can't believe Terry was sleeping on an Army cot at Fite Club. That's hardly living. Moving in with Ray and Abby should give him a broader story. Looking forward to it! Paige repeating Ray's words that Varick's passport was the key to the deal has me worried. Is she going to be a problem going forward? Also, can she just sleep with Ray and move on? Not really sure where the Mickey story is going these days, other than he doesn't like what his life could become – gin and lawn bowling. Teresa telling Mickey to treat her boy well was lovely. I'm looking forward to the wedding and seeing how she interacts with the whole family. 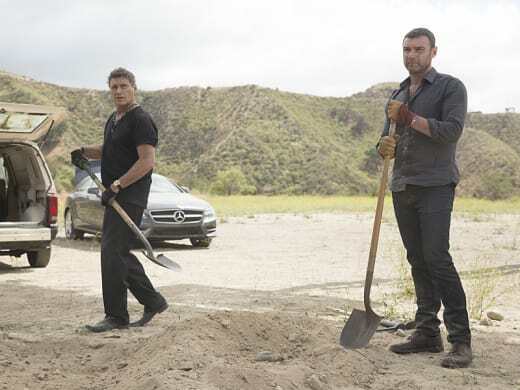 It's hard to believe we're two thirds of the way through with Ray Donovan Season 3. Be back here next week to chat about Ray Donovan Season 3 Episode 9 and drop your thoughts about Varick, Finney, Bridget and all things Ray Donovan in the comments now!